The good news; Catznip R9.0 is significantly more stable than R8.1 and we are seeing a drop in submitted reports in all areas. We're confident this will translate into a much higher position in the TPV viewer directory (expected mid June). Many thanks to the beta testers who helped make this possible! Driver crashes are a little beyond our control, the host OS, driver version, over-clocking (or over heating), or simply changing between rendering modes can account for these. The short version is that we are too small a team to be able to devote much time to chasing and fixing these, so unless we are seeing constant repeats of the same crash in the same driver on the same OS we're kind of sunk. Thankfully this seems to be very low in R9.0 so far. 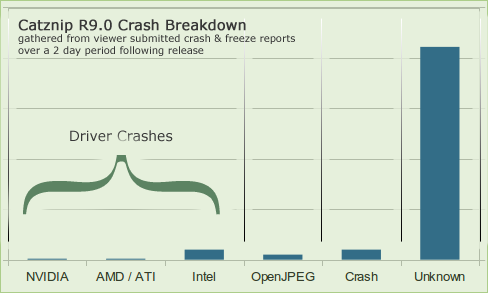 OpenJPEG is also beyond our control and the crash rate is so low it wouldn't be a good use of our time to start trying to fix issues. Crash : These relate to crashes in the viewer and with enough information , help and beta testing we stand a solid chance of fixing these. General rule of thumb, if you crash doing the same thing more than once, you need to report it to us on our JIRA. The great Unknown is actually a collection of many faults that cause the viewer to simply stop running. The viewer peeks at it's log file from the previous run and if it unexpectedly ends it's counted here. Acts of nature : The power goes out while the viewer is running. Failed crash dump : There was a crash and the reporter didn't manage to complete. Task Manager : The viewer has locked up and the user kills it with Task manager. *p00f ! * : Everything was ok then suddenly it all just vanished. Right now we're interested in talking to anyone who routinely kills the viewer with task manager or who finds Catznip has a habit of suddenly ceasing to exist.